Yellow Dog Patrol: Why I Won't See "Unbroken"
Angelina Jolie took on the story to bring it to the big screen, and without a doubt, it is a massive story. However, her story ends at the prison camp. Oh, there is a token epilogue on what happened after, but if you have read the book, you know that's where the true story is. 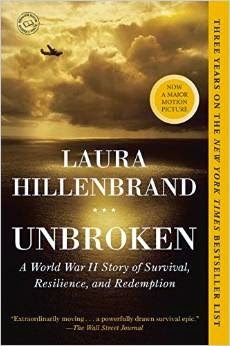 Without getting into detail, Louis Zamperini was saved - scratch that, "redeemed" as the title of the book says - by a personal relationship with God. Ah, but mainstream Hollywood doesn't like all that holy roller stuff, so by all means cut the story short and let's have a movie where a guy gets beat through a large part of it. I cannot recommend Hillebrand's book enough. As for the movie, well, you're going to have to do that one on your own. But if you do see it and feel it leaves you lacking, know that it is because the most important and the best part of the story - the "redemption" part - was missing.